There is so much information available out there when it comes to gas grilling—both fact and fable—that it’s tough to know where to start when you’re brand new to the scene. If this is your first season with your new stove and BBQ Grill Box, read this guide for all the info you’ll need to get started the right way. From terminology to temperatures, this is where you want to begin in your grill mastery. And even if you’re not a beginner…you may still learn a thing or two. Always preheat your grill on medium heat for 10-15 minutes before cooking. Use high heat for searing only for a short time. The rest of the time, use medium for cooking hot and fast, and low heat for cooking more slowly or holding finished foods. With a double burner BBQ Grill Box, you can create indirect and direct heat zones with low heat on one burner and higher heat on the other. This will make it easier to manage how your food cooks—if one burger patty is cooking too quickly, you can move it to the cooler, indirect heat zone. Close the lid to cook food that is thicker than about ¾ inch. Leave the lid open when you’re searing or when you’re cooking food that is less than ¾-inch thickness. The drier the meat, the easier it will be to brown it. Flip cuts of meat frequently to avoid burning either side (unless you’re cooking burgers—then you only want to flip once or twice). Avoid packing food too tightly onto the grill. Leave some space for the steam and heat to rise around the edges for an even cook. Cook on medium to high (use high for only a short time) for hot and fast searing. Leave the lid open so your food is only getting heat from one side. Thicker meats that are at least 1-inch thickness will hold up to searing better than thin cuts. Move the cut often (at least once per minute) to brown as much of the meat’s surface as possible and to avoid overcooking. 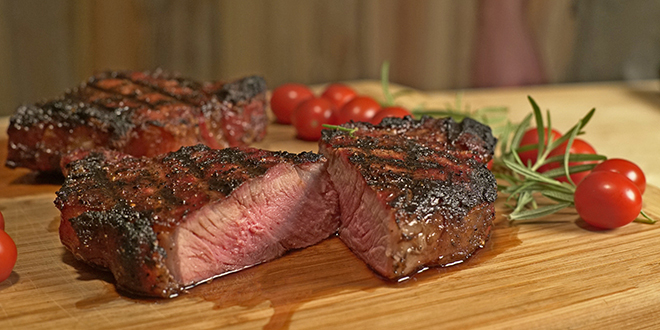 The diamond sear marks might look pretty, but they actually leave quite a bit of the meat unseared. 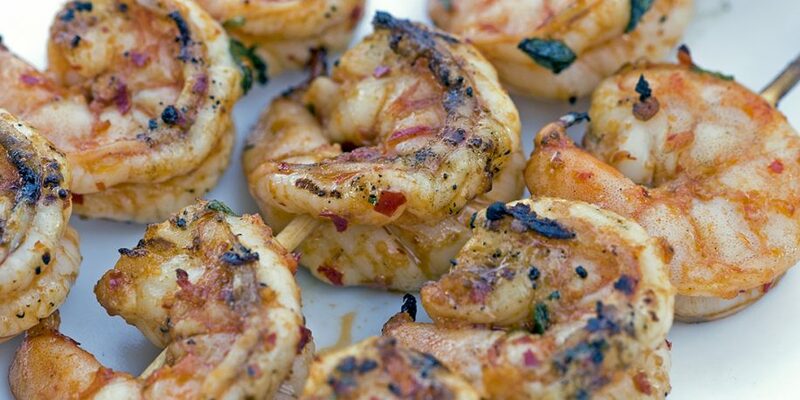 If you’re searing thin foods like shrimp or asparagus, don’t move them around the grill. A few sear stripes on these foods taste better than an entire charred side. Sprinkle Method: Sprinkle a large handful of hardwood pellets directly into your BBQ Grill Box, under the grates, and allow smoking to begin. Keep the lid closed as much as possible to prevent pellets from flaming. Tin Foil Method: Fold a large handful of wood pellets into some heavy-duty tin foil, and crimp the edges closed. Poke a few holes into the foil to allow smoke to flow out. Place under the grates and close the lid. Mild wood flavors are alder, cherry, and our competition blend. Strong wood flavors include apple, hickory, and mesquite. You can also infuse your food with herbal flavors by putting bunches of herbs directly on the grill grates and cooking your food on top. For a complete guide to cleaning your BBQ grill box, check here. What are some grilling tips you wish you knew when you were first starting out? Share with us in the comments below! How would you suggest cooking pork ribs on the grill. We suggest cooking them over indirect heat at about 375° F. After the first 30 minutes or so, wrap them in foil (pour in some apple juice as well) for 30 minutes more. Then unwrap them, brush them with sauce, lower your grill temp to close to 250&deg F, and finish cooking them to temp. I dont know why my bbq box was smoking excessively while cooking burgers. It also created a uncontrollable grease fire. Are there any tips on how to prevent this? Hi, Agustin! We recommend never using more than medium heat on your BBQ Box. Cooking on high could lead to smoking like you described. 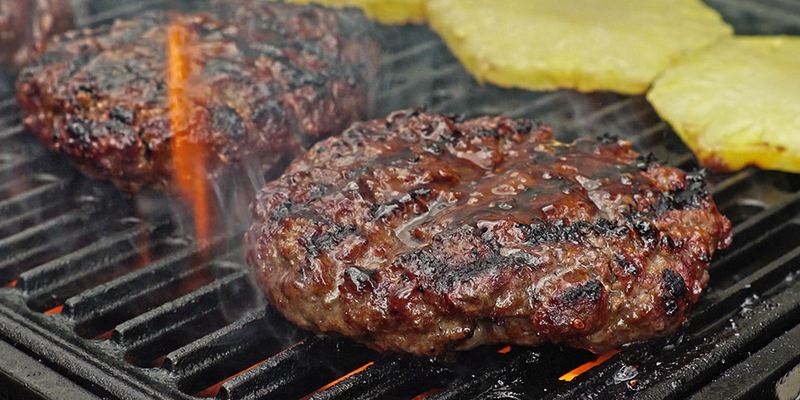 As far as the grease goes, if you select leaner hamburger meat, this will prevent flare-ups. Hope that helps!